There are a few stereotypical use cases for mobile phones and similar wireless devices. The younger generation needs to text their friends. The older generation needs a phone only for emergencies. And, of course, the professional needs their “crackberry” to check office e-mail. I think a lot of people have a need for mobile communications without falling into one of these categories. 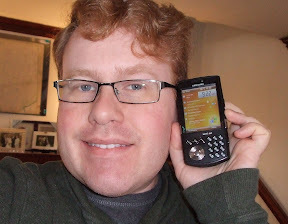 I’ve always had a pretty basic cell phone and I finally decide to buy myself a Samsung SCH-i760 Windows Mobile smartphone from Verizon Wireless. I see my needs being somewhere in between the texting teenager and the e-mailing executive. I do need to keep in touch with work, at least by phone for emergencies, but simple e-mail isn’t a killer app for me. (By “killer app” I mean “application,” some restaurant recently used the term to refer to their appetizers.) Somewhat like the teenager, having a more advance mobile data device is largely a personal investment, although with somewhat different uses. The killer app for me is probably going to be online search, maps, and note-taking and web browsing. The device does a little bit of everything. It has all the functions of a traditional PDA, with a stylus and capability to sync with a computer via a cable. There’s also a slide-out QWERTY keyboard, without which typing messages, for me, would be a non-starter. The unique feature of this model is a separate telephone keypad with physical buttons; with the keyboard closed, you can use these to dial the phone; and with the keyboard open, you can use these when you need to enter numbers as well. The phone supports Wifi, for faster/cheaper data when that’s available. There are a few options for e-mail. First, I was able to get to my company’s Outlook Web Access interface, it’s clunky yet might be the best solution for the times I need this. I was also able to sync with my office using the built-in mobile Outlook application, but I disabled this as it isn’t really what I wanted, and it seemed to keep initiating a data session, which, even though I’m on an unlimited data plan, definitely wasn’t what I wanted. Verizon also includes their own wireless sync system that I haven’t tried. This is where not fitting into one of the stereotypically use cases presents a challenge. Want office e-mail pushed to your device, Blackberry-style? Fine. Want to be able to get access to all your information, personal or business, as you need it, combined in one place? Not so easy. I need to be able to keep my family and work calendars somewhat separate, but may need to access both of them. Similarly for e-mail, tasks, and contacts. So, I’ll probably keep doing a lot of the via mobile web browsing until I come up with a better solution; I’ll probably look at OggSync as I seem to be it’s target use case. I’d also love to find a program that gives me a “prettier” view of Outlook Web Access on a small without requiring my company to do anything differently on its server, or storing message on my phone. Finally, why not an iPhone? I could have done that, I suppose. For various reasons I chose to stick with Verizon, and Windows Mobile is something I still wanted to try out. Maybe next time. A while back I added the tagline â€œinformation, design, & societyâ€ to this blog. I wanted to explain what it means. Information refers to my profession of Information Technology, and also to information in the related, broader sense: how we advance our goals by organizing, selecting, and disseminating words and other data. Design can be many things; it is often visual, sometimes functional, and always creative. While design is often thought of as the province of fields like architecture, I tend to follow a fundamental design process in everything I do, from writing to making dinner. For this blog, design topics include home improvement projects, professional work, or simply better ways to experience life. Of course, design relates to information, in the design of information systems and the graphic design through which information is presented. On one hand, society refers to blog posts about politics, religion, parenting, or whatâ€™s going on around town. On the other hand, â€œinformation, design, and societyâ€ is a powerful combination. The politics of information and the design of information systems can affect people for good or bad. If this blog is really successful, it will be because I find something valuable to say on this topic. Now the fun stuff: typography. Originally, I set each of the words in a different font that I chose to reflect each concept, but I didnâ€™t think the fonts were different enough and it just looked like a mess. The new font is AndalÃ© Mono. I had first thought to type the tagline as â€œinformation | design | society,â€ but I thought that made it sound like I was running a society for information designers, and those vertical bars are so 90â€™s anyway. 🙂 I used an ampersand because theyâ€™re fun. Programmers will recognize that the double slash between the tagline and â€œMarc Stoberâ€™s blogâ€ is the syntax used in some languages to separate a line of code from comments placed at the end of the same line. Incidentally, the idea for this tagline came to me while viewing a design exhibit in the new Institute of Contemporary Art (the ICA), which I recommend you visit, especially if youâ€™ve been to Boston before and are looking for an alternative to the regular museums.